Thanks Kelsie! I’ve been trying to bake with all the berries this summer, but raspberries are turning out to be one of my faves in baked goods! You should totally give buckwheat flakes a try Kelsie! I’m hoping to try them in granola next! I’ve been waiting for these from all of your muffin Insta stories! These look delicious! Raspberries are totally underrated. Can’t wait to give these a try! Thanks Haylie! Haha, I have been overloading my Insta stories lately with muffin testing!! I definitely made my share of muffins this past week! If you give these a try, I would love to know what you think! Happy Monday! My boys go back to school on Thursday! They got out early, so there’s that. I’ve been baking with almond flour a lot and I’m so grabbing some buckwheat flakes to make these. These will be a perfect back to school breakfast or snack. I love them! Thanks Marcie! Kids don’t go back to school around here until after Labour Day, but once August hits, it seems like everyone gets in back to school mode! I’ve been baking with almond flour more and more as I try to experiment with grain-free recipes. Be sure to let me know how it goes if you make these muffins! I don’t think I’ve tried baking with buckwheat. It sounds so hearty for these muffins! Loving the raspberry lemon flavor for these, too. These do sound perfect for back to school breakfast of lunch boxes. I love raspberries in baked goods! Thanks Patrick! They would totally make a nice on-the-go breakfast too! Happy Monday! My mind is blowing that we are starting to see back to school stuff. Seems like the kids just got out of school! Love adding zest to berries – really gives a nice pop of freshness and flavour. I bet these taste delicious, especially with a little smear of butter along with some coffee 😉 Yummy Leanne! 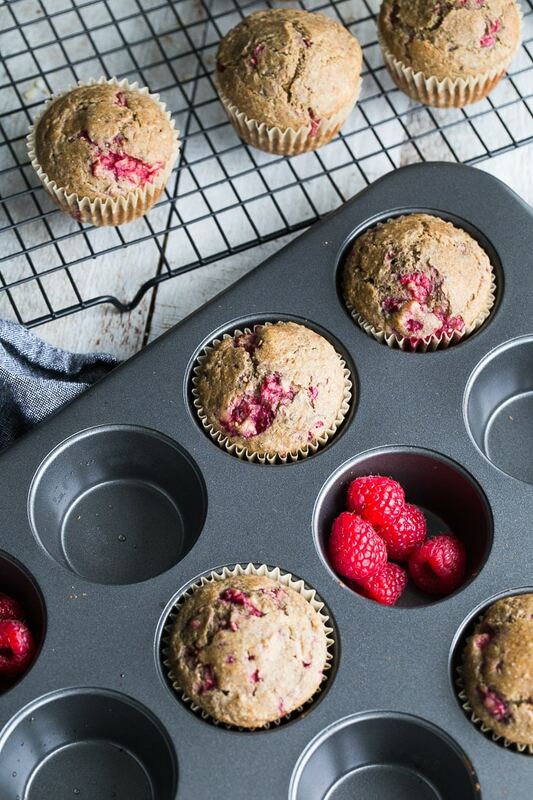 With all those raspberries, almond flour and lemon zest, I can already taste these muffins! I love baking healthy muffins, can’t wait to try this recipe out! Pinned! Thanks so much Neha! The lemon really shines through in these muffins, and I added some cardamom, which also adds a nice little flavour twist! I hope you like these muffins! Keep me posted! Lemon and berries are just made for each other! 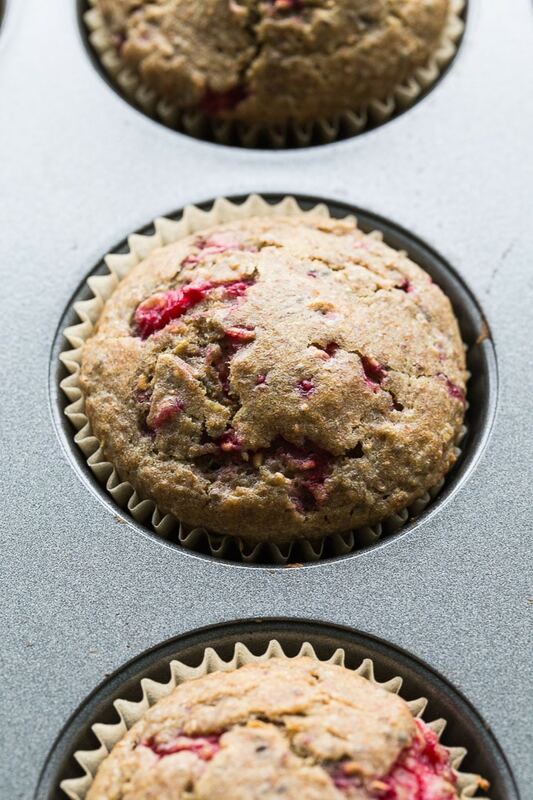 And these muffins have so many yummy ingredients! Thanks Lisa! 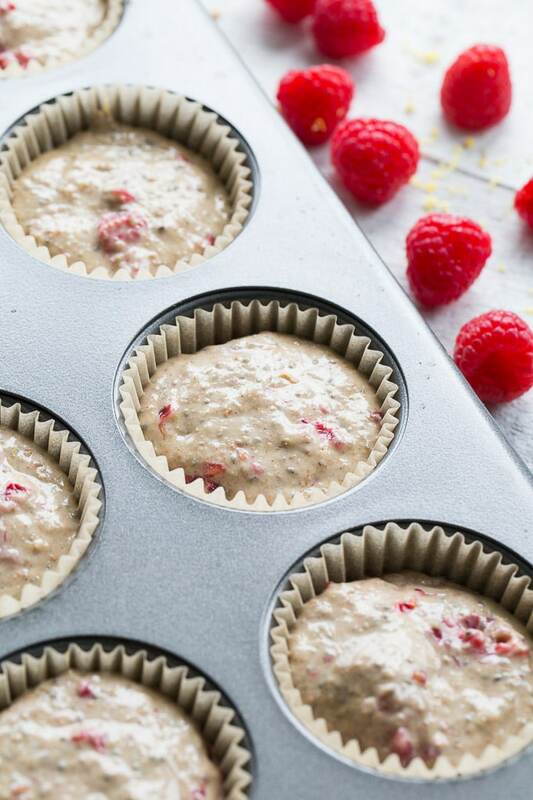 Totally agree – lemon and berries go so well together, especially in baked goods! Hope you’re having a great week! i only recently got into using chia! i usually throw a spoonful into my oatmeal, but i haven’t baked with it before. Excellent recipe! Who knew buckwheat isn’t a grain?? Thanks for the info. Can’t believe we are talking about back to school already…crazy! Thanks Terry! I was surprised to learn that about buckwheat too! And yes, back to school is just around the corner. The summer went by so fast! Yes! 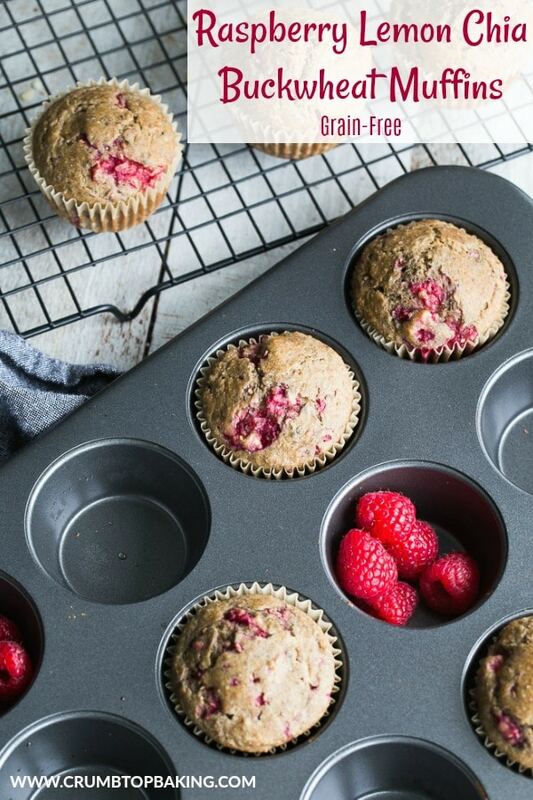 Raspberries make everything better 🙂 I’ve been looking for a tasty breakfast muffin and this looks like the perfect one to try. Thank you for sharing. Thanks Jo! I hope you get a chance to give these a try! I have never tried buckwheat flakes Leanne, but I’m game to give them a go. I LOVE the flavors of these muffins. The raspberries, the cardamon and the hint of lemon! Thanks Mary Ann! 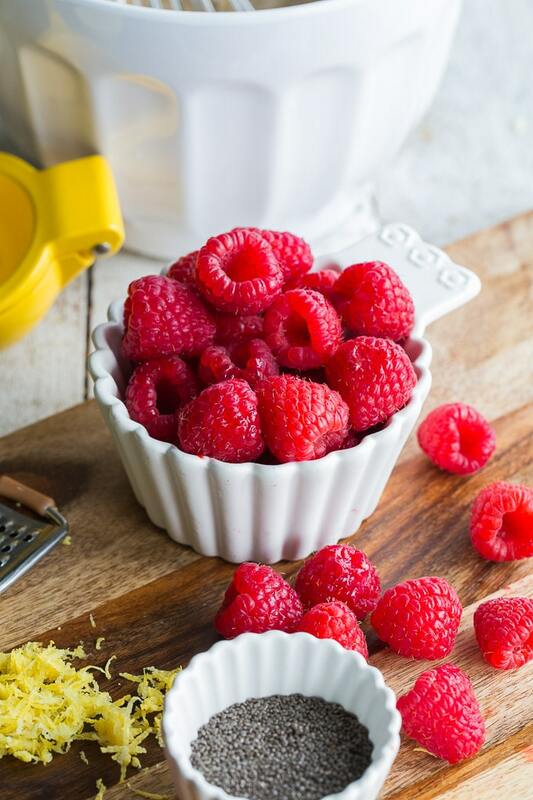 The buckwheat flakes add a great texture and the cardamon and lemon pair nicely with the raspberries! Hope you’re having a great summer! This is just the kind of muffin I love! I think the combination of almond flour and buckwheat and the variations with the berries are brilliant! Thanks Cathy! Appreciate it! It was a different combo for me, but I’ve really been enjoying it! Thanks Lizzy! 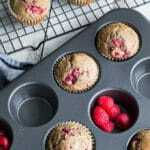 Raspberries are great in baked goods! I really need to incorporate them into more muffins and cakes!